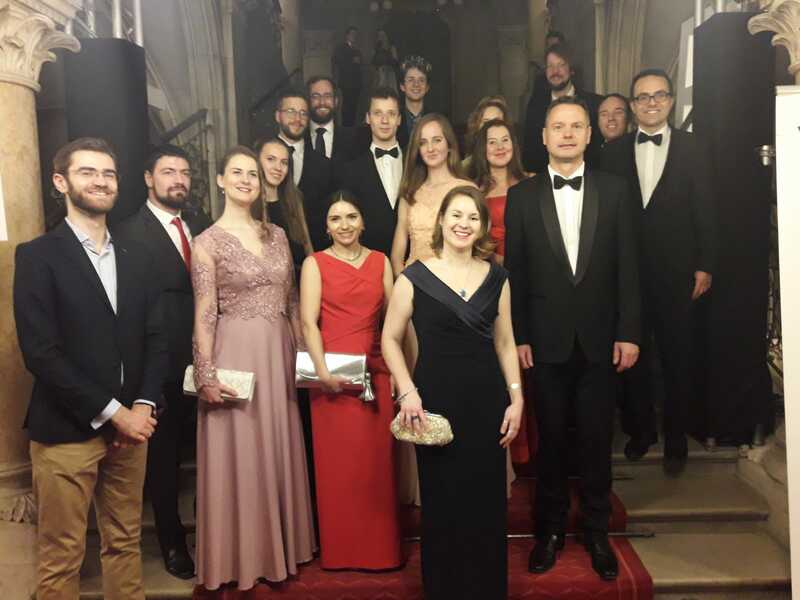 VCLA has once again cooperated with the 5th Vienna Ball of Sciences (Wiener Ball der Wissenschaften 2019). 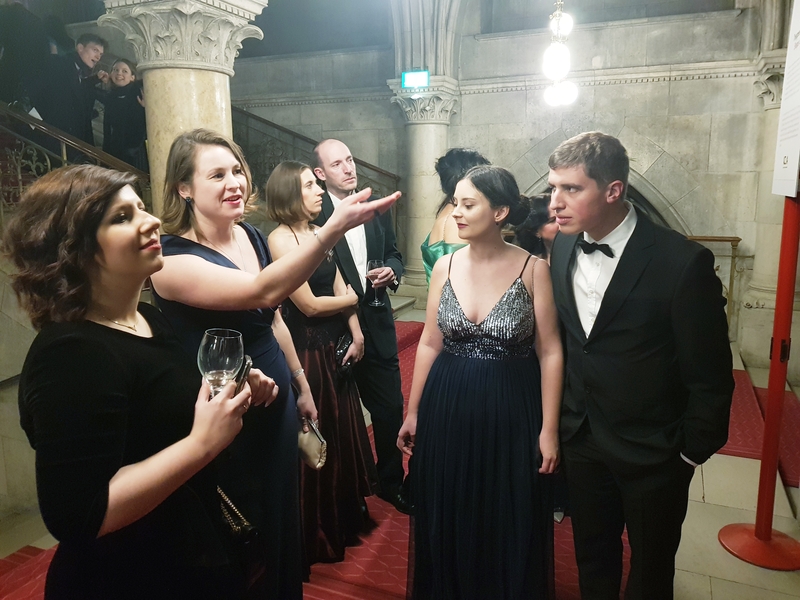 Anna Lukina, the PhD student of the FWF-funded Doctoral College on Logical Methods in Computer Science at TU Wien has designed a custom 3D projection which has transformed the staircase of the Ball´s venue into a living organism. The projection is inspired by the complex and beautiful motion of bird flocks which are swooping or as some call it “dancing” in unison. 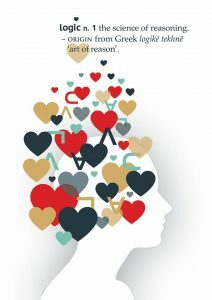 Lukina is using this group behavior, called flocking, in the projection of symbols, demonstrating the interplay between myriad of disciplines, and among scientists from all around the world, who all share love of reason and logic. Wittgestein on science: “Science, is driven by a commitment to making progress, to ‘onwards movement [and to] building ever larger and more complicated structures’; it involves an endless quest for novelty, ‘add[ing] one construction after another, moving on and up, as it were, from one stage to the next’ (Philosophical Remarks p. 7). The story of the projection is a praise of reason and logic. Logic is a tool which is shared across the academic disciplines. Moreover, even though people rarely have to mathematically prove things in real life, we are using logic anyway. In computer science, logic is used to examine algorithms for errors, and to enable computer programs to reason about the world. Especially in the growing field of Artificial Intelligence, we see an increasing use of the methods of logic. Computers, which can learn on their own without the corrupt or biased data could be seen as the step towards joining the statistical techniques of machine learning and logic-based automated decision making. Curiosity of the ancient Greeks led to usage of logic to explain natural phenomens on the basis of observation, and thus creating the basis of the systematic study of logic, which has been used in other disciplines, not only in mathematics. Logic as a powerful reasoning tool, reached its maturity in the form of mathematical logic and analytic philosophy in the early 20th century, with significant contributions from Vienna – the Vienna Circle. The Vienna circle was made up mainly of physicists, mathematicians, and philosophers, who were dedicated to investigating problems of logic, science, language, and mathematics. The Vienna Circle attracted some brilliant intellectuals, including Moritz Schlick, mathematician Kurt Gödel, economist Otto Neurath, logician Rudolf Carnap, philosophers of science Sir Karl Popper, or for example mathematics Ludwig von Wittgenstein. 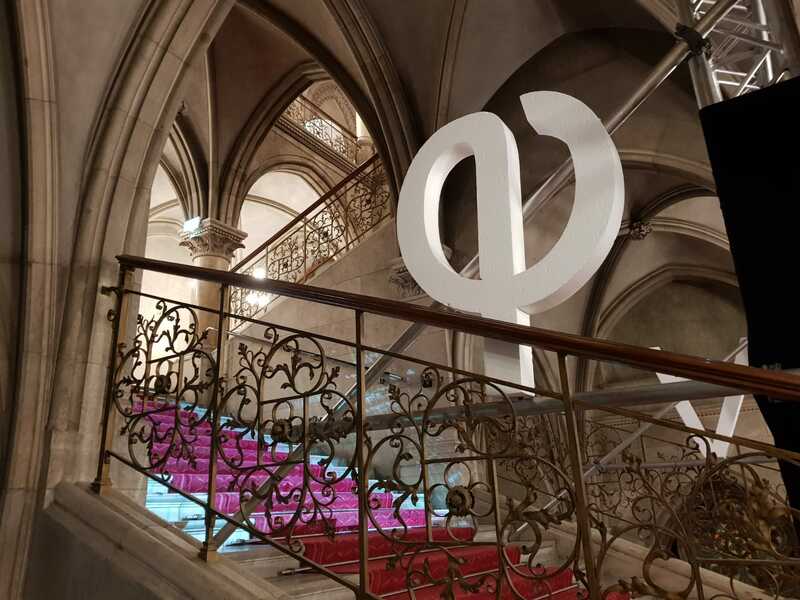 In the last two decades, Austria is observing its revival, with important contributions from the Institute for logic and computation at the Faculty of Informatics at TU Wien, which meanwhile belongs to the five best in the world. The researchers at the Institute together with their colleagues at the TU Graz and JKU Linz, who are part of the FWF-funded doctoral college Logical Methods in Computer Science – LogiCS, are gathered in the research groups, which host the Vienna Center for Logic and Algorithms. Anna Lukina, and the logicians from TU Wien, and LogiCS, on the steps of logic with Heinz Fassmann, Oliver Lehmann, Michael Ludwig. Photo: SciBall/R.Ferrigato. 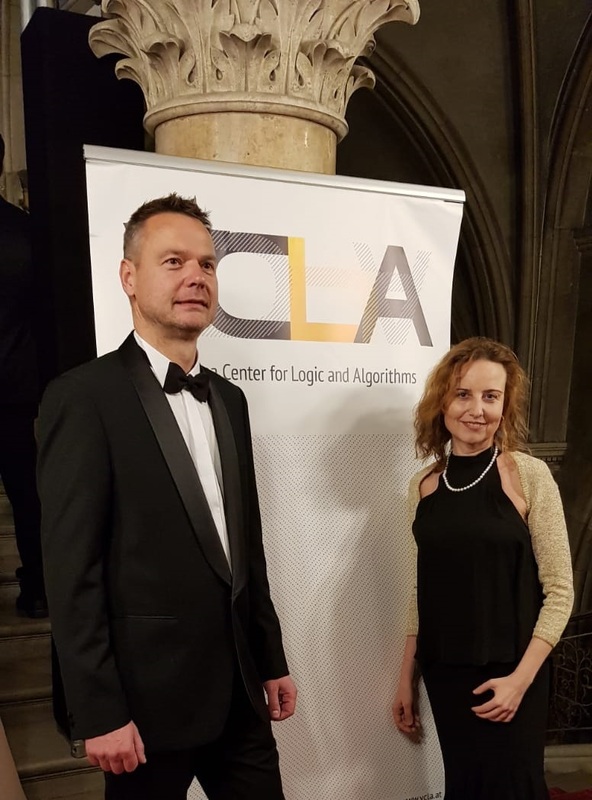 The VCLA co-chairs (from the left): Stefan Szeider, Agata Ciabattoni. Anna Lukina, the designer of “Steps of Logic” TU Wien and Michael Ludwig. Photo: SciBall/R.Ferrigato. Anna Lukina designed the story of the projection, which is manifesting the symbolic and technological fusion of various scientific disciplines sharing the ideas rooted in in the Vienna Circle. 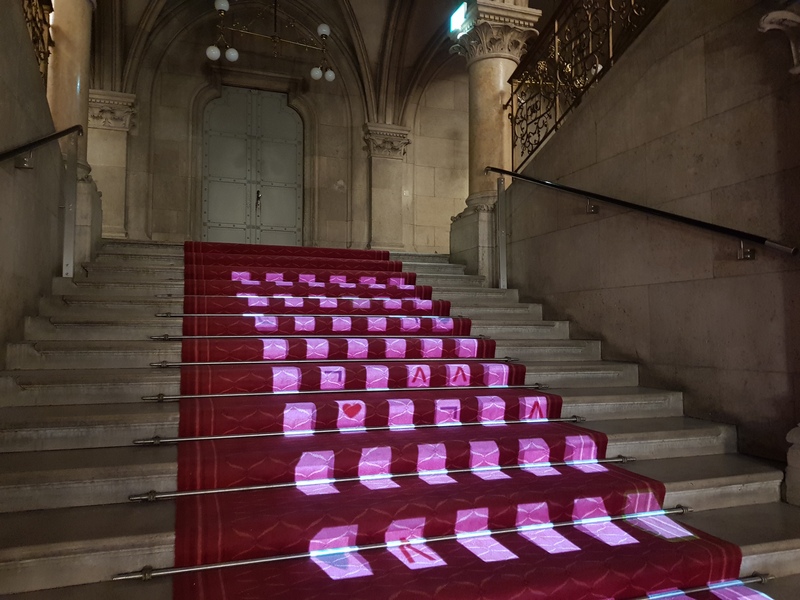 The 3D projection consists of sequences which are site-specific designed to fit the staircase of the Vienna Town Hall. The message of the projection is contained by the symbols: logical symbols, figures of dancers, diagram of an atom, and basic geometric elements such as cubicles, interacting with each other in a pattern called flocking. 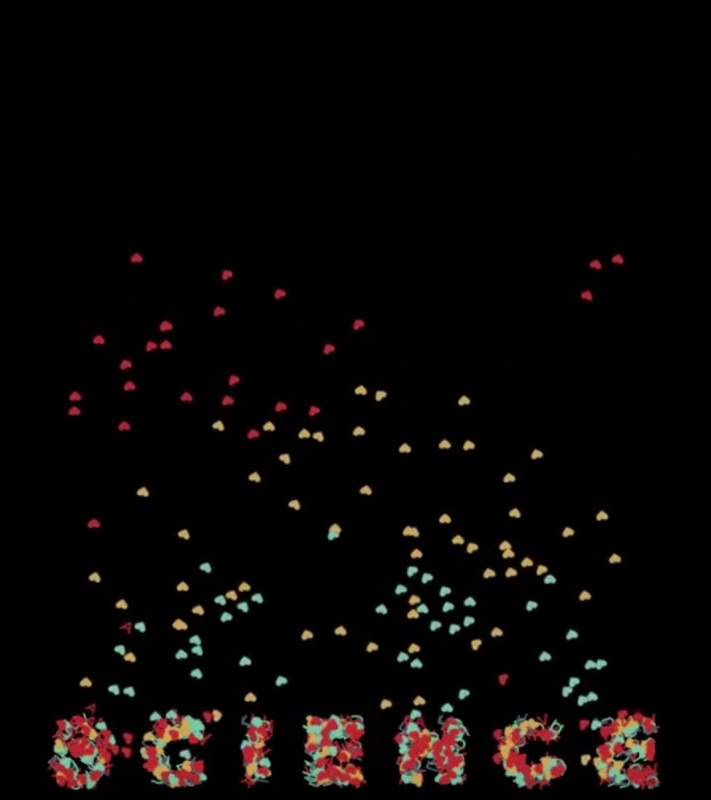 This flocking or a dance of symbols is part of the very definition of an algorithm and of all things Viennese – the Viennese waltz, which has been in November 2017 added to the UNESCO Austrian list of intangible cultural heritage. From the dance of the logic symbols designed for the VCLA series of public discussions LogicLounge, to the sequences filled with the figures of the dancers surrounded by a diagram of an atom, which is among the most familiar symbols of science there is, the projected sequences go beyond aesthetic expression towards something more fundamental: the cognitive ability to construct symbols that communicate meaning. The logic motives of the projection are part of the LogicLounge poster which was designed by by Anna Oberauer (Petukhova)). The motives of the dancers and the diagrams of an atom are part of this year´s poster designed designed by Lilly Pan. The Vienna circle was made up mainly of physicists, mathematicians, and philosophers, whose fortnightly meetings were dedicated to investigating problems of logic, science, language, and mathematics. Led by Moritz Schlick, a philosopher, the discussions attracted some brilliant intellectuals, including Kurt Gödel, a mathematician; Otto Neurath, an economist; three philosophers – Rudolf Carnap, Sir Karl Popper, and Ludwig von Wittgenstein – as well as Albert Einstein and Bertrand Russell. Debates about the possibility of a unified science, the dangerous vagaries of everyday language or the structures of mathematics and logic raged on for more than two decades. The formation of the Vienna Circle began in 1921, even though the regular meetings were held since the winter of 1924 on personal invitation by Schlick. These discussions can be seen as the beginning of the Vienna Circle. The group that met from 1924 on was quite diverse and included not only recognized scientists but also the students. In 1929 the Vienna Circle made its first public appearance under this name (Source: IEP). 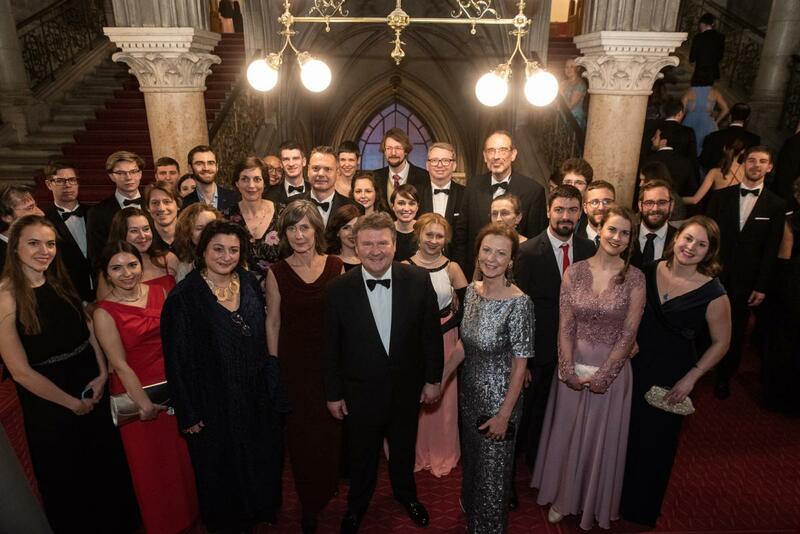 Since the Vienna Summer of Logic, the greatest event in the history of logic, which gathered more than 2000 scientist from the field of philosophy, mathematical logic, computer science, and artificial intelligence in the summer of 2014 in Vienna, the VCLA has been continuing to cross the lines between the academia and the public. The logic symbols used in the projection have been designed for the Vienna Summer of Logic´s poster by Anna Oberauer (Petukhova)). The LogicLounge discussion series is organized by the Vienna Center for Logic and Algorithms at TU Wien, hosted by the logic and computer science community in Austria gathered around FWF-funded Doctoral College LogiCS, to raise awareness on the impact of the research in the areas of logic, philosophy, mathematics, computer science, and artificial intelligence among the general public. Following the successful debates during the Vienna Summer of Logic 2014, the largest conference in the history of logic research (see here), initiated by the late VCLA co-chair Helmut Veith (1971-2016) and Oliver Lehmann, continue to offer insights into the millennium-old discipline of logic, celebrating the antique concept of the philosophical symposium (from Greek συμπίνειν sympinein, “to drink together”). 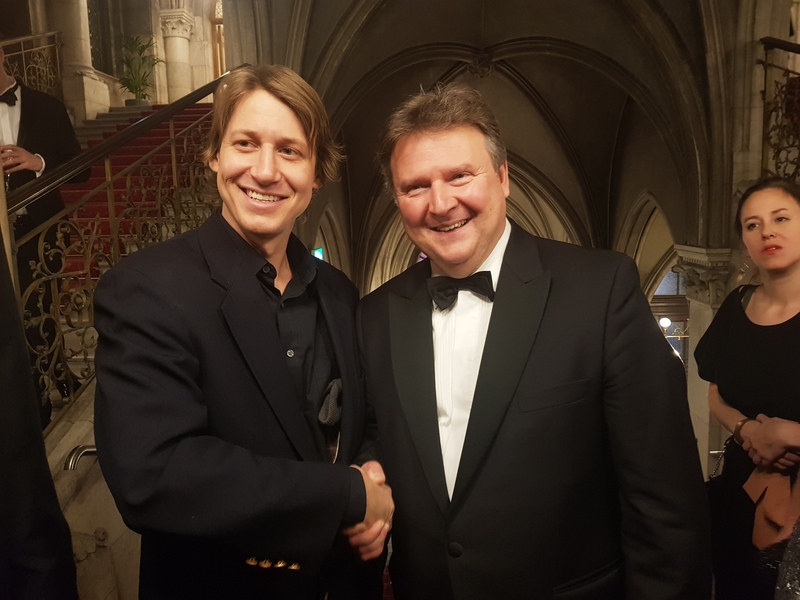 Since 2014 the LogicLounge is traveling the world as a regular event at the Conference on Computer Aided Verification (CAV) in honour of the late Prof. Helmut Veith. The last successful instance of the LogicLounge was held in the autumn of 2018 in Vienna. Featuring so-called “rock star of AI” Prof. Toby Walsh Living in discussion with Franz Zeller on Living with artificial intelligence – How to stay Human, brought together more than 300 members of the public on the grounds of TU Wien. The LogicLounge logo, its hearts and logic symbols, is also part of the projection. The logo was designed by Anna Oberauer (Petukhova)). Steps of Logic in the Ball Magazine 2019, download here.